You are at:Home»Books»The Mortal Instruments & Infernal Devices Jewelry! The Mortal Instruments & Infernal Devices Jewelry! I know I’m not the only one who wishes they could wear jewelry inspired by The Mortal Instruments and Infernal Devices. Do you know you can? There ae dozens of pieces to choose from on hebeldesign.com. The only turn off is that most of the items are pretty pricey. But, just think about what you’re wearing! And, guys….Valentine’s Day is in less than a month. Why not get someone you love a cool pendant or rune locket? 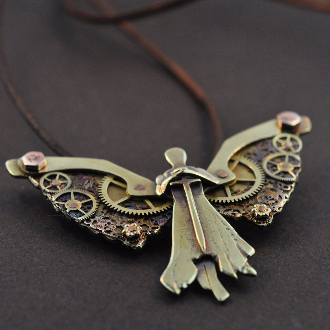 I know I’ll be saving up my money for Tessa’s Clockwork Angel Necklace! There’s even jewelry that our male Shadowhunters out there can enjoy! Wouldn’t you feel totally badass if you were wearing the Morgenstern family ring? To view and purchase the jewelry, click here. So, what sweet Shadowhunter things would you buy? The Fans are hard, but these are no ordinary Fans. Southern California native who likes movies (Star Wars, Marvel, Love Simon), books (Shadowhunter Chronicles, NA, YA fantasy, Red Rising series), TV shows (Supernatural, The 100), food (sushi, seafood, steak, all kinds really), and San Diego Comic-Con. I also like to write, but don't get to do much of that aside from on here.